Here’s a treat for you. 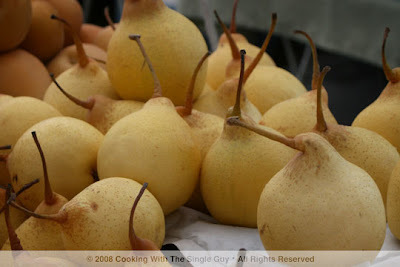 Last weekend at the Ferry Plaza Farmers’ Market in San Francisco, I saw these beautiful pears at the KJ Orchards stand. This is a type of Asian pear. But while most people are familiar with the crunchy Asian pears from Japan, these have their roots in China and are known as yali. I thought they looked really intriguing with those long, dark stems. Just like the Asian pears from Japan, the yali pears are really crunchy. But they’re not as watery as the Japanese pears. And they’re more fragrant, with almost a banana-like perfume and taste. 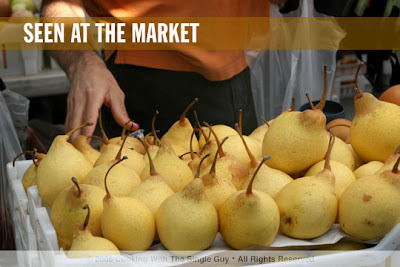 This is the time for fruits like apples and pears, so next time you see these pears with the long stems, give them a try. 12:42 p.m.—Here I am at the back of the line. What’s nice is that Sprinkles has a glass wall so you get to watch the people inside and start thinking about what you want to order as you wait. Hmm, mocha or lemon ginger? 12:47 p.m.—I reach the point right outside the door. 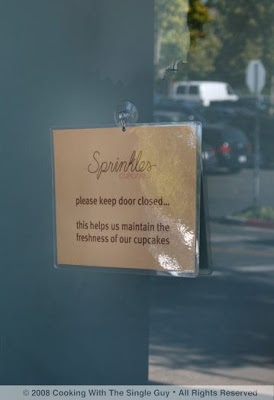 There’s a sign that asks you to keep the door shut in order to “maintain the freshness” of the cupcakes inside. And they’re really serious about it. When I finally got inside, I kept hearing the girls behind the counter yell at people to keep the door closed. 12:48 p.m.—It only takes a minute before I was able to get inside and get a better look at the interiors, which has a really nice, open feel. There’s a bar with stools along the glass wall where people can sit and eat their cupcakes. At the far end is a whole display of Sprinkles items to purchase, including cupcake mixes and T-shirts. Talk about branding! 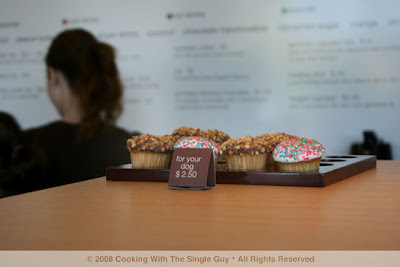 12:51 p.m.—After quickly looking over the cupcakes, Melissa behind the counter takes my order. I know her name because it’s on my receipt. I started to rattle off some cupcake flavors when Melissa tells me that not all cupcakes are available every day. To know which ones are available, I have to look for the ones with the dot next to them. Ugh, more studying. I end up making some snap decisions. I hope I ordered the right ones. I walk by to the register and notice these cute little cupcakes. Turns out they’re for doggies. I know, right? 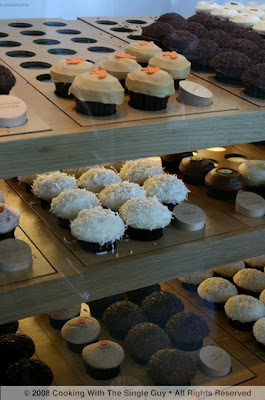 12:53 p.m.—The cashier calls my name and then I walk up to pay for the three cupcakes I ordered ($3.25 each). I pay $9.75 and am told to wait for my box to be beautifully wrapped and presented, but my box came just as I was getting my change. Here it is in this simple brown box. I spent the rest of the day tasting the cupcakes. 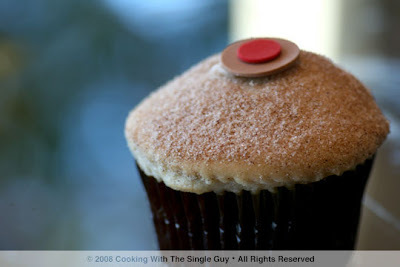 First up was the cinnamon sugar, which I ate at Sprinkles before I left. I liked the idea of cinnamon but the cupcake looked the smallest of the three I purchased. The taste? Oh man, it was sad. The cake itself was moist but kind of dough-ey, almost like a doughnut. It wasn’t super sweet, which is good because I don’t like really sweet things and I heard Sprinkles’ cupcakes were super sweet. The sad part was the icing, which was oddly dry, which gave the cinnamon-frosting almost a cardboard-like feel. Plus, that weird little Sprinkles dot on the top is hard like candy and not very tasty. I walked around the mall and then walked along University Avenue to visit my favorite fro-yo shop, Red Mango, since they still haven’t opened an outlet closer to my home. 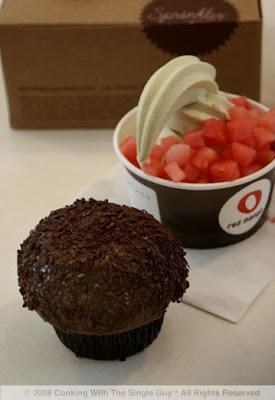 I got a small cup of the green tea yogurt with watermelon toppings, and ate it along with the dark chocolate cupcake from Sprinkles. Finally near the end of the day I caught the Caltrains back to San Francisco and on my way back I ate my last Sprinkles cupcake, the strawberry. Yuuuuccck! 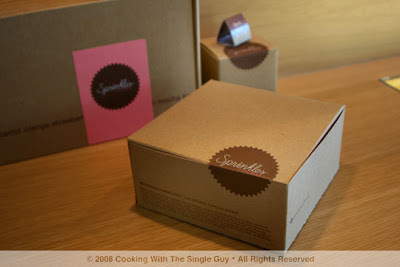 I think I’ve discovered the cupcake that gave Sprinkles its super-sweet reputation. The strawberry frosting was like candy and achingly sweet. Even though it had a nice strawberry aroma, nothing about the cake tasted or looked like strawberry. Even worse was the fact that the cake had this odd beige color to it. You’d think a strawberry cupcake would look pink, but it was beige. And, oh yeah, it also had that stupid inedible candy dot on top. Not very appetizing and I actually couldn’t finish the cupcake. As my train arrived in San Francisco, I got rid of my brown Sprinkles box, tossing away any remnants of my Sprinkles Saturday of cupcakes (and fro-yo). My only memories of the day are these pictures and the little cake belly that developed around my waist as I ate three cupcakes within two hours. 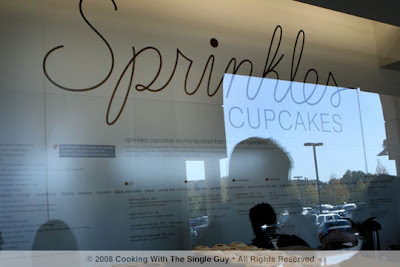 Sprinkles may have the brand-appeal and is definitely suited for the Stanford Shopping Center, but I don’t think it’s the best cupcakes around. 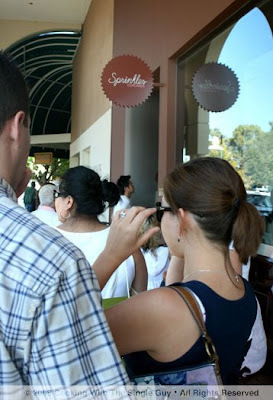 With Kara’s Cupcakes also open at the nearby Town and Country Village, I doubt you’ll have to worry about any super long lines in the future at Sprinkles. The night scene in Buenos Aires is all about the clubs. So it’s no wonder that even the hip restaurants in this city are blaring with club music as they gear you up for the long night of partying ahead. 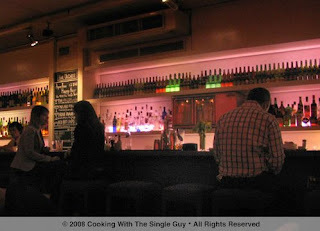 Along the long wooden bar was a lounge area in the center, where you can also order food. (While this area seemed fun and relaxing, I couldn’t understand how anyone ate in that setup. A low, cushioned banquette surrounded equally low tables, making it seem like you were dining at your friend’s coffee table in the living room.) In the back is the more formal dining area with a view of the wood-burning mud oven, which churns out thin crusted pizzas all night. 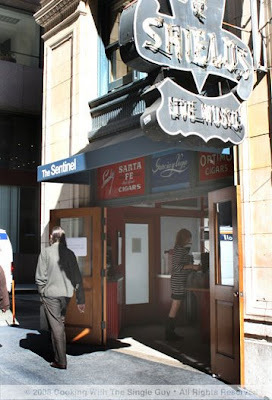 The staff is friendly and courteous, and the people who served me were very comfortable speaking English. The crowd in this packed restaurant was a mix of tourists and what looked like porteños (the word for a native Argentine) out for a casual dinner. 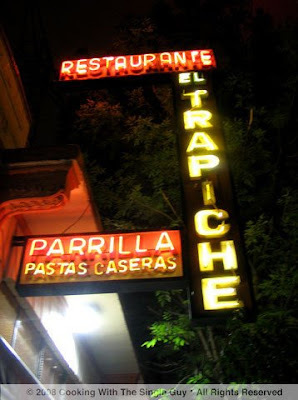 The extensive menu (with English translation) included many familiar Italian specialties like charcuterie plates and ravioli, as well as Argentine specialties like grilled beef from the parrilla. Like I mentioned earlier, pizzas are made fresh from the wood-burning oven. Side note: Bar Uriarte is one of the few modern restaurants in the city that offers wine by the glass. I had a 2003 premium Malbec that paired nicely with the quail. For my main course, I was tempted by the duck confit risotto or grilled sweetbreads, but since this was early on during my trip, I felt I needed to try the famous Argentine beef. 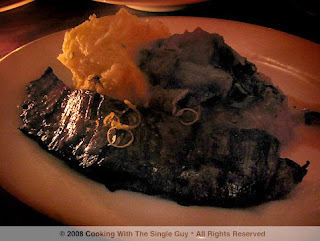 So I ordered the Entrana al grill marinada, or Ribeye Steak (AR$35 or $12), which came with mashed potatoes and whole roasted tomatoes (a common side at other restaurants I ate later in my trip). The beef was nicely grilled and easy to eat, but I wouldn’t describe it as amazing. Like traditional Italian cuisine, all the dishes were slightly salty (with sea salt evidently used to season everything). I didn’t mine the extra salt flavoring, but if you’re sensitive to salt, this might not be the place for you. I also ordered with my dinner the Arugula Salad with Roasted Pears (AR$29 or $10), which came at the same time as my ribeye. The salad was huge, with several large pieces of pears and a few strips of fresh prosciutto. It was a classic combination of arugula, pears, prosciutto and bits of goat cheese all balanced well and quite filling. As the evening went on, I could see the DJ spinning records—oddly from one end of the bar instead of his own little station. 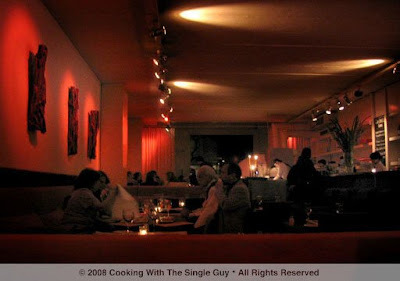 A crowd started to form at the door as people waited for tables, and while the night was just starting for them, I was so full that I was ready for the quiet walk back to my hotel. 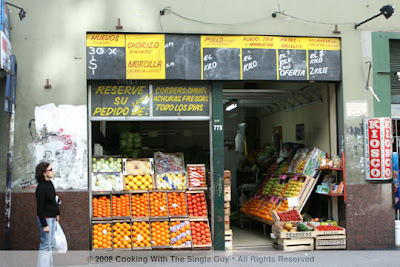 This is the first in a series recapping my recent trip to Buenos Aires, Argentina. Check back every Monday and Tuesday when I’ll be giving you a taste of my food adventures in this South American metropolitan city. Argentina is known for its meat. Similar to Niman Ranch beef, the cows in Argentina are fed grass and live a pretty stress-free life, getting to roam the acres upon acres of open land that is Argentina. 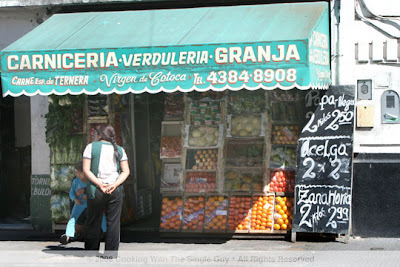 So you can’t go wrong eating beef in Buenos Aires – they’re often very tender and very cheap. And the best place to find it is in a parrilla, which is basically a grilling restaurant just like a steakhouse back in the states. Despite the fact that I ate on the early side, the restaurant was pretty filled with a mix of locals and tourists. Even though it’s highly recommended in the tourist guides, El Trapiche still had a very local feel with its simple décor, including burlap covered legs of jamon hanging from the roof. The room was brightly lit, making the white cloth-covered tables even more stark. 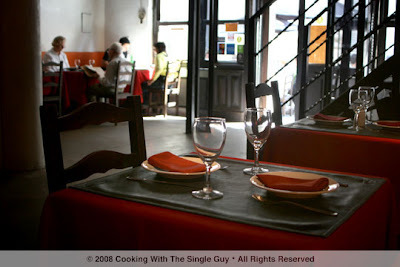 The multi-page menu (English included) is filled with a variety of meat dishes and Italian pastas. Argentines have a very deep connection to Italy. But what I discovered, after shifting through the pages and pages of dishes, is that a parrilla is not made for a solo diner. For example, wine isn’t sold by the glass, just bottles. 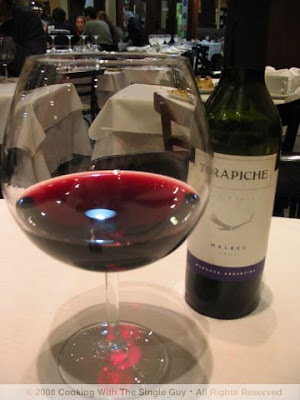 So I ended up ordering a half bottle of Malbec. Then as I tried to order some dishes with my waiter, he kept looking at me like I’m some kind of weirdo and telling me that I’d be satisfied with just one order. See, what happened was I knew I wanted something from the parrilla, or grill. So I ordered the Bife de Lomo (sirloin steak) for AR$44 (or $15.25) but I wanted some salad to counterbalance all the meat I knew was ahead. So I ordered the Caprese Salad (AR$31 or $10.75) because everything else sounded too big. But I also wanted to try their pumpkin squash pasta because it sounded really interesting. The waiter told me it was a big dish and that I wouldn’t be able to eat all the pasta. Then later on I wanted some plain rice because I’ve been eating meat all week and no real grain, so I had a craving for rice. But even that was considered too much and my waiter convinced me not to order it, even though I wanted just a side of white rice. So after drinking my Malbec, my Caprese Salad arrived, looking actually quite big. The waiter served a bit of it for me to start, and it was nice and fresh. 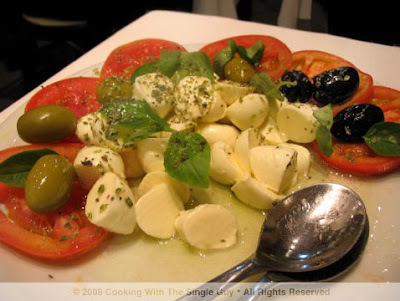 But it did feel filling, with its mozzarella cheese and olives, so I didn’t eat the entire salad, saving room for the beef. 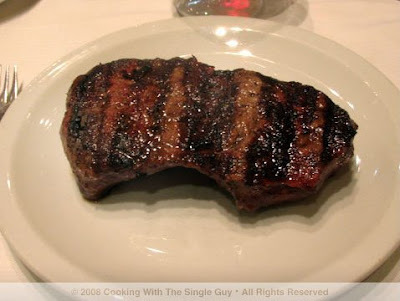 When the meat arrived, it looked a bit lonely on the white plate by itself. Turns out, most people typically will order several dishes from the parrilla to share. A plate of the rabbit or maybe the matambre de cerdo or thinly grilled pork steak. I’ve seen some people at the other tables with a steak covered with French fries, but I’m not a fries person. 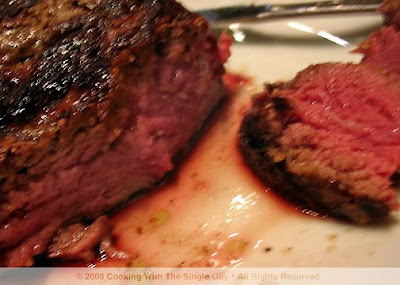 … the meat was so incredibly tender and juicy, just cutting into it was like cutting into the soft billows of butter. I’m not generally a meat eater back home, so to be honest I really didn’t have a point of comparison. But if meat back home was just like this, then maybe I might take up eating meat more often. The waiter was right. After slowly eating my meat, taking time to appreciate each bite, I was nearly full and couldn’t really eat any more. I think that steak was maybe 1 lb. or a bit less, but it still seemed filling even though I was able to finish off the entire plate. Sure I could have ordered the fruit-filled crepe for dessert, which is flambéed at your table, but I really couldn’t eat any more. The meat did satisfy me, and I was done for the night. El Trapiche has a friendly staff, despite the fact that few of them speak English. 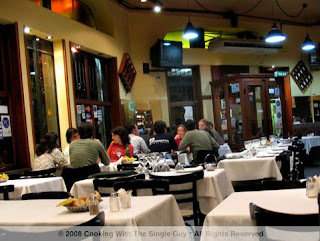 They’re all very comfortable helping tourists (mostly telling them not to order something) and the meat is perfectly cooked in this quintessential Argentine experience. 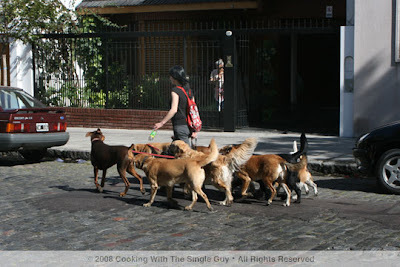 Argentines love their dogs, so rumor has it that the best paid jobs in town is that of a dog-walker. During the days, you’ll see some dog walkers with more than a dozen dogs. One thing about a city with a lot of dogs is that there are a lot of mines on the sidewalks. So watch where you walk, because you never know when you’ll accidentally step on a gift from one of those pups. 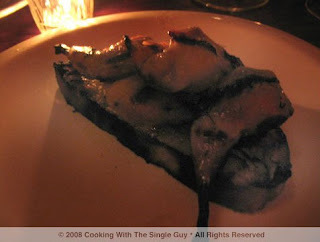 A few weeks ago, I read a San Francisco Chronicle article touting squid as a healthy and cheap alternative to fish. I never thought of cooking squid at home, although it is an item I love to order at restaurants. When I travel to places near the sea (like Barcelona), I love to order squid or calamari. Many of the Americanized recipes feature squid in a salad or risotto. But when I thought about making squid this week, I recalled a stir-fry dish my mom would order at the Chinese restaurant. 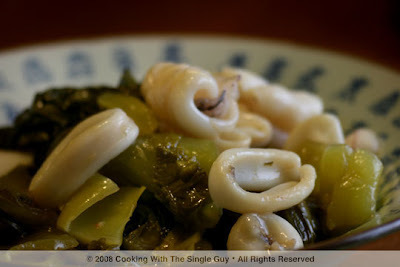 We’d often order pickled mustard greens with beef (a dish I replicated in my own recipe here), but sometimes my mom would grow tired of the dish even though us kids loved it, so she’ll end up asking the chef to make the dish with squid. The key to cooking with squid, which is what I learned in that Chronicle article, is that you have to cook it fast (just 3 minutes) when you’re grilling it or cook it very long (more than an hour) if you’re stewing it. Since this was a stir-fry, I went the fast route. So you can imagine that this was a super fast dish to make for a weekday dinner, especially since the pickled mustard greens are already preserved and you don’t need to cook them very long or else you’ll lose the crunch. The squid turned out really nice and soft (I got them already cleaned from the fish counter at Piedmont Grocers near my home) but I have to say the package of pickled greens I bought were a bit salty. So it makes a difference which brand you try. I’m definitely going to cook squid again because it’s a quick and healthy meal to make. Enjoy! Cut squid into slices and score them (with a knife, gently make cross cuts on the squid), which will help them curl into a nice tube. (Or you can cut them into circles.) Season with salt and set aside. In a wok or large skillet over very high heat, add sesame oil. Once the oil is heated, add the squid and let cook for about 2 minutes (don’t stir too often to allow for some browning of the squid). Quickly add the mustard greens and stir fry with sugar, wine and soy sauce for another minute. Taste to see if you might need to add more sugar. Makes 2 servings. Serve with jasmine rice. Pair with a glass of Riesling wine. TIP: Some of the fancier fish markets will already have fresh squid that’s been cleaned, or if you by frozen squid and defrost them, the frozen versions are often cleaned already. If you get fresh squid that hasn’t been cleaned, you need to make sure you remove the ink sac inside. IN A PICKLE: The pickled mustard greens are sold in most Asian grocery stores in either the preserved foods section or near the vegetables but in the prepackaged sections. Most of the mustard greens are from Thailand sold in vacuum-packed bags or jars. Each brand will be different, some more salty than pickled, other more sour. That’s why you need to balance it with the sugar when creating this dish. It's been awhile since I've been to the San Francisco Ferry Plaza Farmers' Market, so this morning with the sun shining bright, I ventured across the bay for some local sustainable shopping. Who else was there? 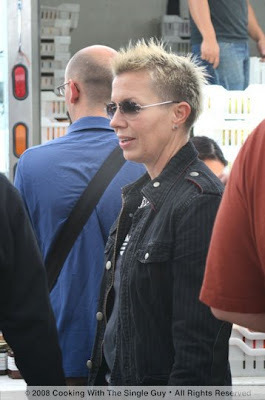 Why, it's celebrity chef, cookbook author, "Iron Chef" competitor Elizabeth Falkner. I spotted Falkner at one of the fruit stands that was overflowing with fall-time pears and apples. I think I saw in the plastic bag she was carrying some crab apples. Maybe for tonight's desserts at Orson? Open for weekday breakfast and lunch, 7:30 a.m.–2:30 p.m. I bookend my recent vacation with a free day in San Francisco so I could explore things I normally don’t get to see because I’m stuck at work in Oakland. 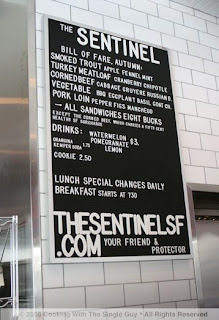 On my return this week, I spent my last vacation day in the city checking out Denis Leary’s sandwich shop, The Sentinel. 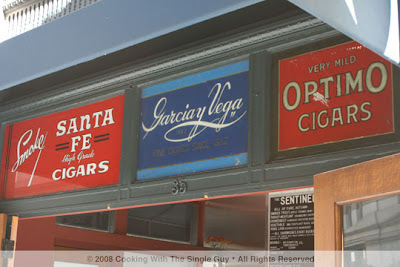 Less than six months ago, he opened a sandwich shop in a small, former cigar storefront across the street from the Palace Hotel just south of Market Street. His idea was to create incredibly delicious sandwiches for a Financial District crowd who may have lots of sandwich options but none close to this. 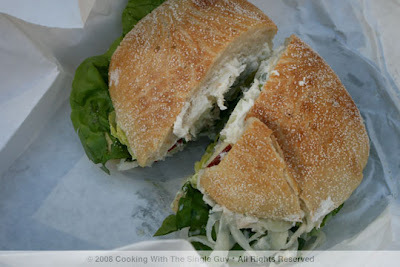 Now Chef Leary’s life is spent making sandwiches during the days at Sentinel and cooking dinner at nights at Canteen. This guy is just a ball of energy. I arrived early to beat the crowd, and found out that The Sentinel serves breakfast and then closes to regroup for the lunch rush. You enter through the side door on Stevenson Street, but there were already two people there when I arrived as the door opened at 11:30 a.m. One guy in line behind me says he comes two to three times a week to grab lunch to take back to the office. The menu features about six regular sandwiches that are offered through the season (things like corned beef, turkey meatloaf and roast beef), a daily soup and a daily special that’s typically a salad (on the day I visited it was a Rockfish Salad with marinated tomatoes). I wanted to try something unusual, so I ordered the Smoked Trout Sandwich with fennel, apple and horseradish sauce ($8). 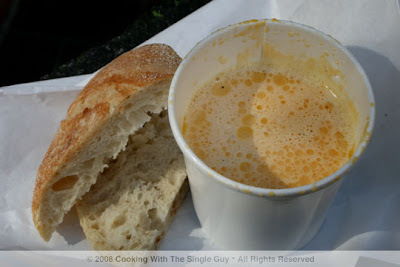 I also ordered the soup of the day, which was a Roasted Acorn Squash Soup ($5). Chef Leary and his crew have the lunch ordering system down like a fine-tuned machine. 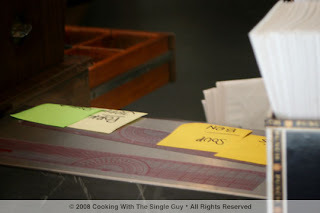 You place your order with Holly, the girl who everyone seems to know at the register, and then she places a colored post-it with your name next to Chef Leary. Each color corresponds with a particular sandwich. I was impressed with the efficiency of how things ran, and I got my sandwich and soup after waiting maybe five minutes. I ran off to find a place to sit (luckily the weather was beautiful to be outside) and opened my bag to unveil my sandwich. The smoke trout was flaked in between a crusty bun that was a bit tough to bite into. My sandwich was loaded with slices of fennel and apple, and pieces of mint leaves—all held together by the creamy horseradish sauce. Despite the fact that the trout got lost in the sandwich, I enjoyed it and appreciated the creativity Chef Leary put behind this sandwich. With the squash soup, I knew I would be in for a treat because I’ve never tasted a bad soup at Canteen. And I was right, because the squash soup with its autumnal bright orange color and bits of squash pieces was as sophisticated and comforting as anything you’d find at a Michelin-star restaurant. The soup is served with sourdough buns that I used to slop up every bit of the rich goodness inside my recyclable container. The Sentinel has created such a following and works under such an efficient system that I couldn’t help but chuckle in my head thinking I was standing in line for the Soup Nazi. 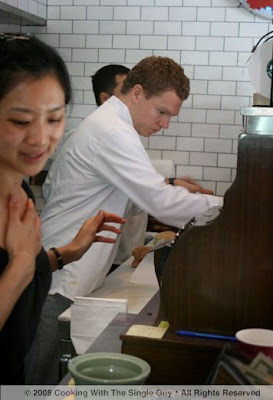 But Chef Leary (sometimes quite serious-looking when he’s working) is far from a control freak barking out orders, but instead has created a personable little lunch stop where he regularly builds relationships between the food and his fans. This is a mini review so no rating, but this is the kind of place that I would take a day off just to visit. Lunch daily, 11 a.m.-3:30 p.m.; dinner, Sun.-Thu., 5-9:30 p.m.; Fri. and Sat., 5:30-10 p.m.
A couple of weeks ago, I finally made it to Burma Superstar – the highly popular Burmese restaurant that has been attracting crowds to San Francisco’s Clement Street. 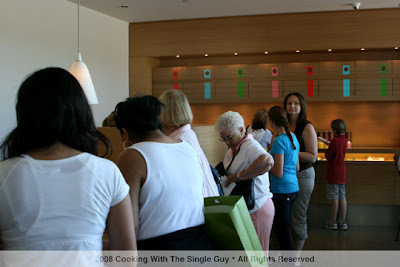 I made plans with my friend Lisa to beat the crowds by having dinner at 5:30 p.m. But when I arrived, the tiny restaurant was almost full. Ironically, Lisa was running late and that actually worked out well for us because by the time she arrived, several tables for two turned over and we didn’t have to wait at all for a table. 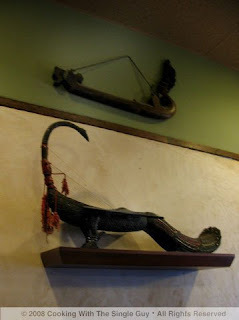 The unassuming exterior isn’t at all like the rich, tastefully decorated interior with dark wood furniture and colorful walls with accents of Southeast Asian ornaments. Like I said, it is pretty small, and what I found that to mean is a lot of noise. It was hard to catch up with Lisa, whom I haven’t seen for years. We started dinner with one of the more popular dishes – the Tea Leaf Salad, made up of Burmese tea leaves, tomatoes, lettuce, dried shrimp, fried garlic, sunflower seeds, peanuts and split yellow peas. I’ve had tea salads at other restaurants and they often have a more herbal taste and look. 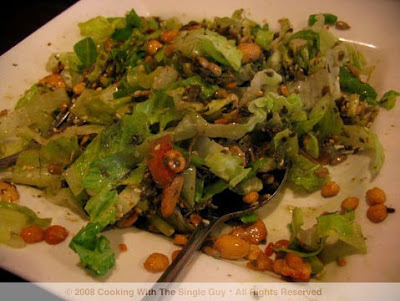 But at Burma Superstar, its version is definitely more like a westernized salad with the familiar green lettuce serving as a bold backdrop for the rest of the ingredients. It’s the grounded tea and dressing of fish sauce and lemon that give the salad a distinctive taste. It came to the table with all the ingredients beautifully presented separately, but I only got a photo of the final mixed salad because the server went ahead and tossed the salad at our table before I could stop him for a photo op. In many of the Burmese or Malaysian restaurants I’ve eaten at, I’ve always ordered any dish that featured mango as an ingredient. 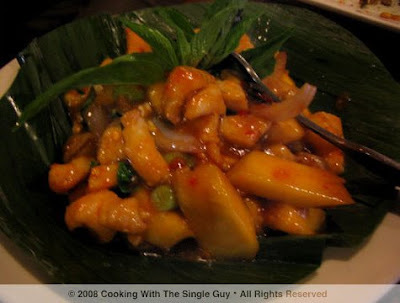 So I convinced Lisa to order the Mango Chicken, which is made with a light chili and basil sauce. When the dish arrived, I marveled at how orange the mango chunks looked (some places use under-ripen mangoes that are more yellow) and their taste matched the color as they were sweet, blending nicely with the chicken breast. The dish was balanced and fresh, and was the star of the evening (as all mango dishes should be). Our final entree was a curry because we both figured we should try one. 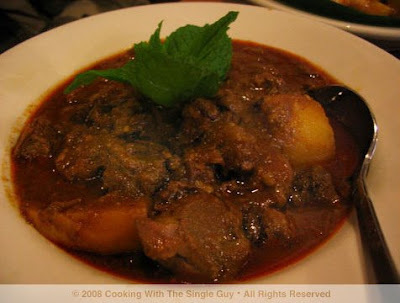 We took the easy route by ordering the Burmese Style Curry with Lamb, which is Burma Superstar’s special curry. The dish itself came out looking very brown and kind of boring. While the lamb chunks were tender, both Lisa and I agreed that the curry wasn’t very spicy or distinctive in taste. It was a bit generic. The restaurant’s young staff was very friendly and helpful and we didn’t feel rushed despite the fact that the crowd outside got larger as the night went on. 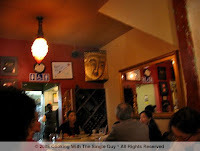 While I did feel the food was tasty and the room charming, I didn’t necessarily feel it was above average compared to other Burmese spots like the nearby Mandalay Restaurant on California Street. 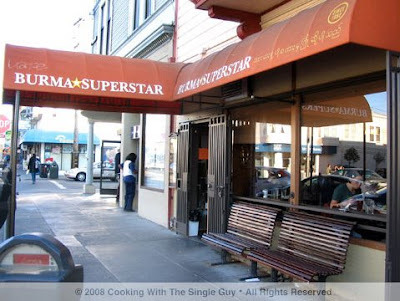 If you can deal with the crowds and the wait, then Burma Superstar should be on your list of restaurants to try. But if you’re craving good Burmese food, then places like Mandalay or Nan Yang in Oakland will probably satisfy you without the hype. I'm back home after 22 hours in either an airport or airplane. Ugh, dang United Airlines (they definitely are not the friendly skies any more). My trip to Buenos Aires now seem so far away. So I put together this short little video on one of my many plane rides as a reminder of my 10 days in this South American city. Dang, I just found out that we have to set our clocks one hour ahead tonight. So really, as I'm writing this, it is nearly 2 a.m. Sunday when really it should only be 12:50. My body is now totally jacked up right before I head home. But I think I gain back the hours, don't I? I'm so confused. So you know I've been eating my way through my vacation, which sadly comes to an end tomorrow. 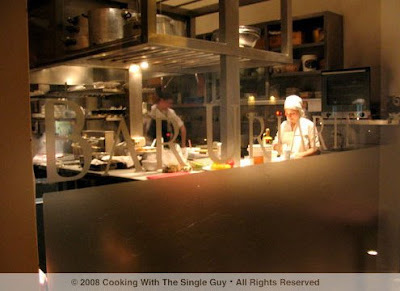 :( I thought I'd share with you what I've learned about dining out in the city. It's like wheat prices aren't affecting Argentina because every where you go you always get a full basket of bread. And I'm not talking about a simple bowl with a few pieces of bread, I'm talking a real basket with a full array of bread, from buns to baguette toasts to bread sticks. They even bring this whole basket to solo diners, which I kind of think is a lot for one person. 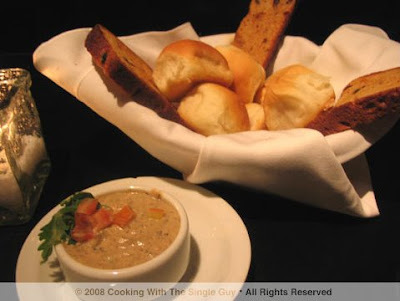 Another thing that often accompanies the bread basket is some kind of tapenade or spread. The flavor varies from restaurant to restaurant, but I had some really yummy spreads, from traditional olive-based spreads to creamy garlicky ones. In a meat-eating country like Argentina, finding a good salad is a challenge. And the common dressing for salads always seem to be oil and vinegar. 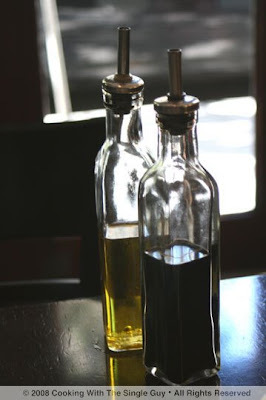 When you order a salad, the server will typically bring you a cruet of oil and vinegar or bottles containing these. Then you dress your own salad. While the oil and vinegar route is a clean and simple way to eat a salad, I did miss the variety of dressing we get back in the states. 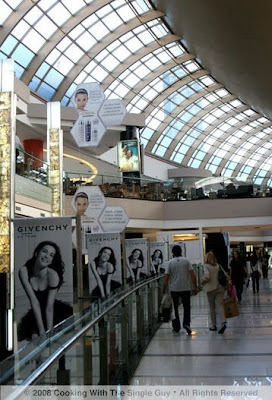 The tax for everything you buy in Buenos Aires (including hotel rates) is 21 percent. Oftentimes for meals, this is already included in the price listed on the menu. But one thing that isn't always clear is what's known as "cubierto." Some restaurants will charge this on your bill and some will not. 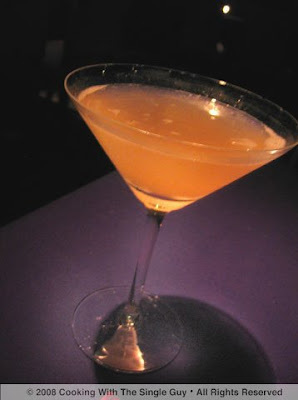 Cubierto loosely translates to "cover charge" or "table service." I've been to a couple of restaurants that charged me 6 pesos (about $2), and I'm not sure if it's because I was a solo diner taking up a table or if they charged everyone a cubierto. I know for sure there wasn't a show or musical act. Like I said, not everyone charges this. But if you see this on your bill, don't be surprised. 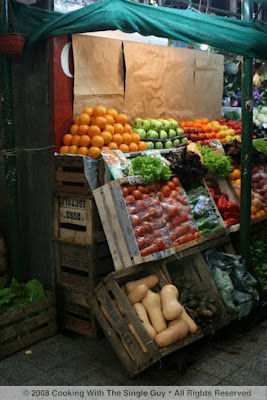 Walking around this city, you'll often see these little fruits and vegetables markets, or mercados. They remind me a lot of the green grocers in New York, and not just because most of them seem to be run by Asians. What's interesting is they display their fruits in a crate box slanted up. Sometimes before the store opens, you'll see the boxes wrapped up with plastic wrap. I still haven't really figured out the hours of the neighborhood mercado. They seem to open early in the morning then close down for lunch, then open up right before dinner time when people are going home and grabbing some fresh vegetables for dinners. Most of the fruits and vegetables here don't seem very exotic, unlike the mercados in Spain that had all these amazing, exotic looking fruits. 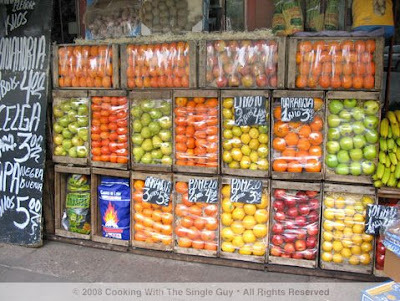 In Buenos Aires, it's mostly oranges, apples, bananas and artichokes. Then I remembered that the climate is very similar to Chile and we see a lot of these same fruits from Chile in our markets in the United States. So blame it on the American tastes! Ha, just kidding. Maybe it's the climate. BA Preview: Vegetarians ... Avert Your Eyes!